The food stalls at one corner of the large Inya Lake. North of Yangon's city center is the large artificially created Inya Lake. 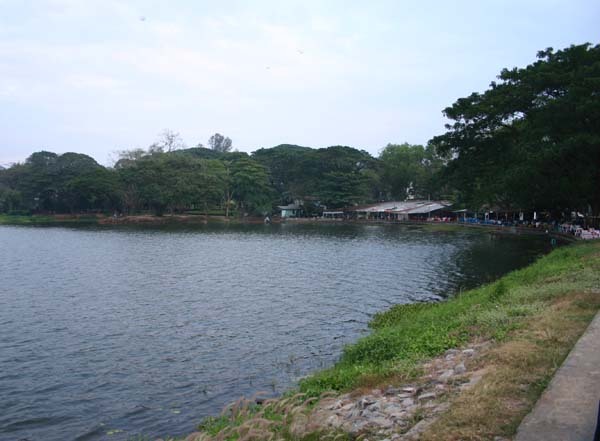 Like the Royal Lake, the shores of Inya are home to extensive parks, food stalls and hotels. The area around the lake is also home to several artisans and shops selling decorative items for the home. The park is extremely popular around sunset, when young couples walk the banks or sit on the benches lining the pavement. Clustered around the southwest corner of the lake are a group of food stalls that are extremely popular at night. They are constantly changing, and the far ranges from local dishes to Thai noodles.